The fundamental British values of democracy, rule of law, individual liberty, mutual respect and tolerance for those with different faiths and beliefs are already implicitly embedded in the Early Years Foundation Stage. 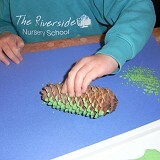 How do we promote British values at The Riverside Nursery School? We give children opportunities to develop enquiring minds by encouraging children to ask questions. Prevent is the name given to a national strategy which aims to stop people from becoming violent extremists or supporting terrorism. There is a responsibility on Early Years providers to keep children safe and promote their welfare. We have a duty to have due regard to prevent people from being drawn into terrorism.